Daughter says! 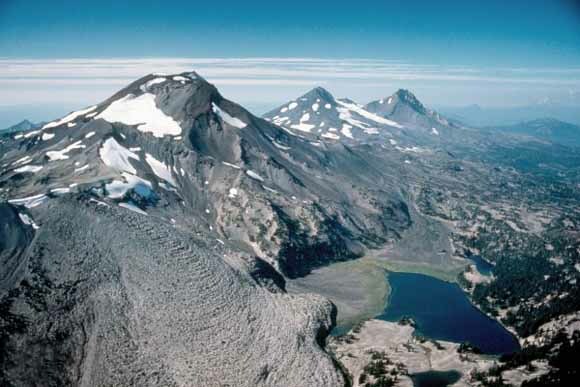 -- Risa, don't get out of shape, you have to climb South Sister with us this summer. So start training! 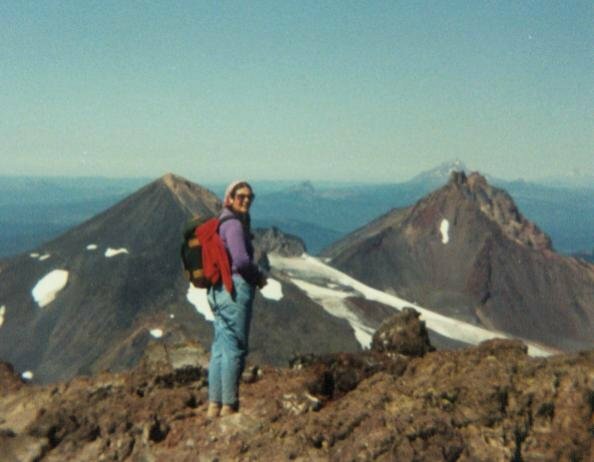 For those who don't know, this is the view (with Beloved, back in the 80s) from the top of South Sister. We're talking 10,300 feet. It's in our county; we have quite a bit of varied terrain hereabouts. Here's a longer view. Daunting, hmm? That's (left to right) South, Middle and North, hence the Three Sisters. So, we've been up this thing three times, it's what people around here do for fun. Not a technical climb, despite its looks; more a very strenuous walk. But Risa will be sixty-two and has struggled with weight this winter like never before. She's on it (ok, trying to be on it) about the food, but her usual exercise -- farming, a little biking, and light kayaking -- these help but they're not gonna lift her 4,300 feet (starting at 6,000 elev.) in a six hour hike (and five hours back). So she's borrowed a pair of five pound ankle bags from her son and loaded eight liters of water into her rucksack, and is off to the river every day (when not sick). That's a three mile round trip. She may tack on miles when it gets a little warmer out. We'll see. Live around Eugene, Oregon? Your blogista is talking to you. Risa has been focusing on growing, preserving, and storing food she has grown, but with the acceleration of worldwide food uncertainty, she's been thinking: "I have a truck, a scale, and some time, how about forming a food club and taking advantage of wholesale pricing on storables, such as wheat berries. Also, with industrial GMO and monoculture issues, it's time to support those local organic farmers." So, here's what the wholesaler wants. There are discounts for purchases of over certain amounts, like 15% for $500. But you get the full wholesale for $150.00 a month. It's complicated drumming up $150.00 a month from a small group of people, because of the size of wholesale lots, like thirty pound jugs of honey or fifty pound bags of wheat, but if each club member is willing to order at least once a year, and there are a dozen members, we could do it. Right now there are three members, and the first order has been picked up and delivered. So, May is open to new (note: that's new local) members, and June, and so on, giving you time to a) message Risa via fb or risasb [at] gmail [dot] com b) receive the price list c) decide what you want. She'll order it and either bring it by or hold it for you, C.O.D. We had heard it would snow overnight, but it didn't, or not in our immediate vicinity. Risa got up, built a fire, hit the coffee buttons, and slipped into her rubber clogs to let out the chickens, ducks and geese. Then the air became thick with the stuff. View from the end of the driveway. By noon, five inches of it had fallen, and then the sun came out. It was about forty degrees (F) out, so most of it was gone by nightfall. We went about our business in shirt sleeves and sunglasses, much as though we were visiting Miami Beach. Rosemary peeks out from the herb bed. Tracks are from spreading greywater on the beds, or what Risa hopes are the beds. Kale, collards, and beets shaking off their blankets in the sun. Risa's impressed with the Northwest winter-keeping qualities of collards and prefers their flavor to cabbage. Relatively bug-free through the summer, too. Here's a nutrition chart on them. She thinks they should be part of the food liberation of many, many lawns. The cold part of this snap comes tomorrow night. The lamp is already on in the pumphouse. Must remember to re-cover the figs. Risa continues her experiments with the wood heat stove. She'd be in heaven with a wood cook stove, but we haven't had one since about 1982. Yet we've, for thirty-five years, always had wood heat, and collected much of the fuel ourselves. The present stove came with the house at Stony Run and sits in a corner of the dining room; it has built-in reflectors driving heat to the front, as it's a model intended for use in mobile homes. Its location is not terribly convenient to the kitchen counters, but better than if it were in the living room. There's a fireplace there, but we've blocked that up and taken the chimney down to solve leak and fire danger issues. Pictured here is the dishwater heating up, along with lunch. That's a Chiot's Run tomato soup in the canning jar, or almost one: add some flour, some milk powder some dehydrated veg flakes, some spices, and stir. Suzy's is much the better recipe, but then we all know Risa's a bit haphazard. We have a surplus of watery tomato puree on hand, much of it 2009 vintage, and we're making a run on the bank for tomato soups accordingly. As Risa's prone to burn the bottoms of such soups in a saucepan, leading to a lot of labor at the sink, she's taken to heating the soups in the dishwater. The canning jar doesn't seem to mind, but if you prefer not to risk shattering one by misjudging temperature differentials, try a stoneware pitcher or crock. "Seems like a mighty long time" -- at last, something that resembles gardening. We've cleaned up some of the horrendous mess in the potting shed and made up a flat of kale and a flat of collards. Our kale seed crop did not really come through last year, so we used some seed that's now two (or is it three) years old, so the seeds were sprinkled liberally in lieu of a germination test. We don't mind thinning if it turns out they're still viable. The Ancona ducks have now been banished from the garden so that certain things they were nubbing will grow again, such as the rhubarb and comfrey. Three of them then moved to the freezer. Well, two to the freezer, one to the roasting pan, with potatoes and onions, some seasonings straight from the herb bed, and a bit of wine -- used the homemade, which seems a bit underaged yet, but OK for cooking. This turned out well. The filbert and a coppiced maple needed some thinning, so Risa made beanpoles -- extra tall ones for scarlet runners. Here they are seasoning on top of a couple of the woodpiles. Let's get a closer look at the actual garden. Most of the beds are resting, but there are still plenty of last year's kale, collards and beets on tap. A much easier winter in our locale than the previous three. Oh, and! Hung out laundry. On the line! Now that's spring. Risa likes to do four loaves when using the oven, and one when using the Dutch oven at the wood heat stove, but today she didn't feel up to stirring a big batch or lugging around the iron pot or watching the fire, so she punted and just made the amount of bread dictated by the stock/water from steaming a small Hubbard squash for the chickens, which came to two loaves. This water, orange in color and quite aromatic, she poured off into the blender, added some home-dried veg flakes, a fresh leaf from a head of winter collard, some dried apple wedges, and brown sugar, whizzed it all together, and poured into the mixing bowl. As soon as the temperature of the liquid had fallen to suit her test finger, she stirred in some yeast, and let it sit for awhile. When she came back, the cauldron was bubbling, so with eye of newt and leg of frog a small handful of sea salt and a cup of spelt flour, she began the long stir, adding more and more spelt till the lump of dough "rose off the bowl." She shaped two loaves on the spot, gave each three slices across the top, and plumped them down on a greased cookie sheet. One hour at 350F in the oven later, she pulled the sheet, set it on the open oven door, and tossed the loaves onto the edges of the sheet to cool. Her view is that every day she should add a little something to the world. Create, construct, repair, scavenge, forage, plant, harvest, put by, feed. And then maybe a little rest, with tea. We take an interest in lighting in and around our household. Though we have no skylights, we like to work near windows if the weather keeps us indoors. There are a few lights to help visitors navigate to the house, and there are light switches in the barn and potting shed, thanks to my dad who wired them at the age of eighty-one (he's now ninety-three). We've painted all the interiors white, which helps with our rather paltry number of light sockets. We're not averse to occasionally trotting around, inside or out, with a lantern, like folks from two centuries ago. In power outages, our wall-hung kerosene lamps and candles, and our family heirloom table lamps, always at the ready, spring into action. But we do without quite a lot of illumination, too; rooms we're not in stay dark. What can be simpler? The house was built in 1949, Risa's birth year as it happens. Upon our arrival, we found 75-watt and 100-watt bulbs everywhere. The dining room has a particularly low ceiling, and one of our sons was already particularly tall, so we sprung for two 22-watt Circleline fluorescent bulbs, which at the time were twenty dollars each. They kept out of the way nicely. Eighteen years later they are still in service. Occasionally we unscrew one till it goes out, and just keep the other one going, as needed. So we're often at 22 watts in a space that once required 150 watts to illuminate. We were so pleased with CFL that as our consciousness was raised and the price lowered, we eventually replaced every incandescent in the place. Our monthly billed usage, from this and other measures, has dropped from an average of over 6KW to just over 3KW. Do we still have incandescents? Yes, on a high shelf, and we drag them out to use as heat lamps for chicks and ducklings and to keep the pump company on big freeze nights. They make great heat lamps, but you have to check on them from time to time; they burn out unexpectedly. Our next lighting project has been to replace incandescent flashlight bulbs with single-element LEDs. This comes to nine dollars a pop so far, but not a single flashlight in our possession has yet needed its batteries changed! One of them, a two-D-cell model, was going very dim when we made the change, after only two weeks' intermittent usage; it's been in use for over a year since. We think these bulbs will prove to have been a decent investment. Recently we spotted something new at our local hardware store -- standard size LED light bulbs. They are weakish yet -- can't be used in the place of any of the 13- or 22-watt CFLs that abound -- and are billed as "accent lights," so the ten dollars they're going for seems steepish. But Risa nabbed a few, also a tiny outdoor spotlight of the same type, same price. After all, the brighter ones she's been looking at online are still running around forty bucks a pop. Our entryway is awkward to approach in the night, so when either of us is coming in late, the other leaves on the porch light switch, which is connected to the entryway light, pictured above, as well as the porch light. These can thus be on for quite some time even though not otherwise needed. By swapping out the 26 watts' worth of CFLs that had been in those places, we're now down to -- ta daaa! 5.2 (yes, five-point-two) watts for that homecoming vigil. And the driveway floodlight works great. One can easily see to fetch wood or fit keys in a car lock (we still have that kind, we're Neanderthals). We don't work on car engines at night anyway. So that's 2.7 watts for the time it's on. Risa went back to get it a companion (2-bulb motion sensor) but the store had been cleaned out of these bulbs within hours of their introduction. Smart customers! I know that LEDs are currently being said to have little overall advantage over CFLs, but by selectively choosing low-powered LEDs for the right locations, you can really cut down on that light bill. Friends of ours here describe how, as children decades ago, they walked miles to barter with neighbors—say, trading beans for flour. Such everyday acts would require substantial adjustment for many Americans. To begin with, children would need to be capable of walking for miles; for safety, they would have to know most neighbors along their way. They would have to be able to grow or make things to barter, and their parents would have to know what to do with beans and flour. Do read the whole thing, and especially the last bit. Who's to say her nay? Risa has been pounding in t-posts, not to make fence but for converting some of the current veggie beds to grapes, raspberries and the like. For this sort of thing she likes to put up pairs of posts about two feet apart and then thread some wire through a two-foot section of pipe, lash a pair together, and on to the next pair, then string wire about four feet off the ground all the way round. This sort of thing will not hold up a grape vine, of course, without bracing; her method, which is just barely adequate, is to hammer a pipe in the ground at each end, leaning away from the end pairs of posts, then string wire from post A to pipe to post B, which she tightens by the fence-builder's expedient of threading a pipe or 2X2 through the wire near the leaning pipe and winding the wire tight. Once the wires strung along the bed are tensioned, she props the winder against the leaning-away pipe, so that it will not spin back, and walks away. It's also her pruning time. She's knocking back the grapes a bit, and taking down water sprouts from the apple trees. There are now forty fruit trees on the place, but don't let that fool you. Only eight of them are old enough to produce much, if anything. If she has one piece of advice for those who want to get a small country place or start yardening where they are, it's get your fruit and nut trees, your grapes, kiwis, hops and such, and your berry bushes in now. Not seventeen years later, as she's mostly doing. 'K? 'K. Of the five grown apple trees, three made apples last year, four the year before, two the year before that. The two plums have skipped four years runing, the cherry had a great year two years ago, nothing last year. So you see, forty trees might not be too many, what with the jumbled weather keeping what's left of the bees away from the blossoms, or blossoms freezing off, and so on. The apples from the three trees, and the grapes from the three grape vines, were enough to keep Risa busy for awhile last fall. She has half a bushel of dried apple slices, twenty-four bottles of grape wine, ten quarts of canned grape juice, lots of canned-up applesauce, and has been going through maybe sixteen quarts of apple juice, the most popular of these items. The white wine is a little young yet, but today Risa discovered she can mix it half-and-half with apple juice and -- presto-change-o -- Apple cider! This is a discovery for her because she tends to make apple vinegar when she tries for hard cider, and doesn't feel motivated to invest in enough chemistry or fancy bottle brushes and such to give herself more of an edge. She's willing to make her cider on the spot, and who's to say her nay? Bed #1 is slated for raspberries. Grapes for red wine will finish out Bed #7, which is all white wine grapes at the moment. Yet more fencing is on the horizon, for across the creek. Y'all snow bunnies got your plans done and seeds ordered? Karen Rutledge, age fourteen, lost her father. He was the only human being she had ever known. Thrown into a world that little resembled the books and magazines of her childhood, she made her way to a valley inhabited by farmers and found a place among them. But there were others in her world who were not farmers and preyed upon farmers and "Pilgrims." The valley was attacked and successfully defended itself; weakened by their losses, the people of Starvation Creek took stock. Would they be able to rebuild? And what if the marauders returned? Book II of the Starvation Ridge trilogy. Risa went out to cut off a couple of old-growth kale plants for the chickens. They are so big and heavy it takes a number of swings with the machete to get them down; they fall over with a thump -- just like trees! This resulted in the discovery of some skulking potatoes, and a nice big beet. The ducks had eaten down the beet greens. What do you (Northern Hemisphere question) find in your garden in February? Besides ... umm ... snow ... ? So, what this is, it's a handful of top leaves or head leaves from winter collards. Since they are from the head, they're semi-blanched, like Nappa cabbage. Very mild and sweet, from a long series of light frosts. What Risa's done is chop them up and drop them in a steam basket in her largest Revere saucepan. In the bottom of the pan is 1/2 water and 1/2 liquid left over from pickled beets, for steaming with a bit of acetic acid/beet sugar flavoring. Earlier, she roasted some German Butterball potatoes in the Dutch oven with onions. This did take awhile. She could, alternatively, have boiled the potatoes. The Butterballs are yellow like Yukons and similarly flavored, but they can be harder to clean, so she (gasp!) peeled them, with the peelings going into the compost. The ducks had rolled these spuds out in their quest for slugs, and so Risa is using them instead of her seed potatoes. They came from the same part of the garden as the onion bulbs and collard leaves. The diced potatoes and onions have been stirred together with a bit of olive oil, to avoid clumping. Risa likes to do this with a chopstick. She pops a pie tin on top of the saucepan for a steaming lid and slides the roasted spuds into a bowl, with an inverted saucer over the spuds, and puts the bowl on top of the pie tin. We now have greens in a steamer and potatoes in what is in effect a warming oven. The reason for stacking like this is she has limited woodstove surface to work with and she's ready to put on the main dish. She takes two trout, thawed out from the freezer, and shakes them in a bag with some spelt flour, salt, finely ground veggie flakes, and Mexi seasoning. These trout are smallish, one per person, a Rainbow and a Brookie both caught in a lake in the High Cascades last summer. She pops them in to a Cold Handle frying pan with a little bit of pre-heated grape oil, and sets the pan on the hot spot on the stove, moving the steamer aside. Beloved will be home in about an hour. Risa brings out some home-canned apple juice, builds up the fire a bit and goes out to put the poultry in for the night. If she's timed it right (and she's pretty sure she has), five minutes after her spouse's arrival, dinner will be served hot and fresh.